Abitalk has created around 60 applications and many are not only on the iTunes market but the Android marketplace as well! They are affordable, fun applications that work on math and language skills. In addition, the Abitalk community is welcoming and generous, placing applications on sale every App Friday and giving away application codes on their community Facebook page. They were generous enough to give us application codes to give away as well. 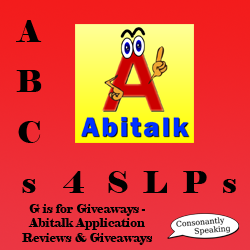 So, without further adieu, here are the application reviews and giveaways for my three favorite Abitalk applications - Sentence Builder App, Irregular Plurals, and Irregular Verbs. There are multiple buttons on the Main Page of these applications some are the same including the Abitalk logo, Help, and More buttons. This menu contains information about Abitalk, gives e-mail support questions, Abitalk's website, Abitalk's Facebook page, and Abitalk's Twitter. Pressing on this icon will bring you to more applications by Abitalk categorized by grade/skill. Pressing the "Help" button will explain how to use the application. Sentence Sound - Whether or not the sentences are read aloud prior to putting them in order. Word Sound - Whether or not a word is stated aloud when pressed. Award - Whether or not the award (gem) will show/play. You can add new users by pressing the "Add New User" button. Type in the new user's name on the keyboard and press "Done". You can also set a passcode to lock or link to Dropbox. Choose a sentence by pressing it. 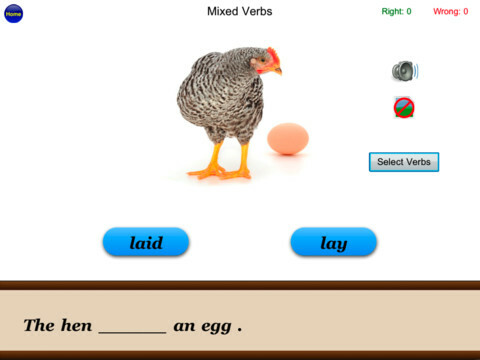 Then, based on the level chosen (Level 1 only has the words required for the sentence; Level 2 has additional words and words required complete the sentence; Self Created Lessons will open a list of sentences created by yourself) a sentence and image will appear to put in order at the bottom of the page. Press, hold, and drag the words in order to the bottom. If you have the sentence sound on, it will read the sentnece. If you have the word sounds on, a word will be read once pressed. Press the checkmark button once you feel the sentence is correct. If it is correct and rewards are turned on, a gem will appear, the sentence will be stated, and cheering/applause will occur. If it is incorrect, a different sound plays. A user can hear the sentence stated aloud by pressing the microphone button. Press the forward and backward arrows to navigate between sentences, press the "Menu" button to choose a new sentence, or after a sentence has been completed correctly the application will move on to the next sentence. Press the "Create Your Own Lessons" button on the Main Menu. Then, press "Add Your Own Lessons". Next, press "Input Group Name" and type via the keyboard. Finally, press "Add New Sentence" to type in a sentence, add a picture, or view a YouTube demo of how to use this feature. Add as many sentences as you would like to a group and it will show up on the "Self-Created Lessons" Menu. Selecting a student and then pressing the graph button will show that students' progress report. Each sentence will show whether or not it has been completed on a list. 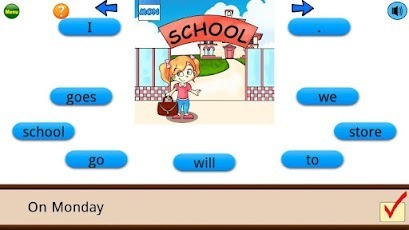 If you choose between the Irregular or Mixed Plurals/Verbs sentences, a cloze sentence will appear for the user to fill in the correct verb. The sentence will be stated aloud and one show or not show the image with the sentence. The user can press, hold, and drag the correct word to the blank space. If the sentence is correct, it will be stated aloud again and the next sentence will appear. If it is incorrect, an "uh-oh" sound will play and the user will have another chance. You can also select the verbs/plurals to use from a list. 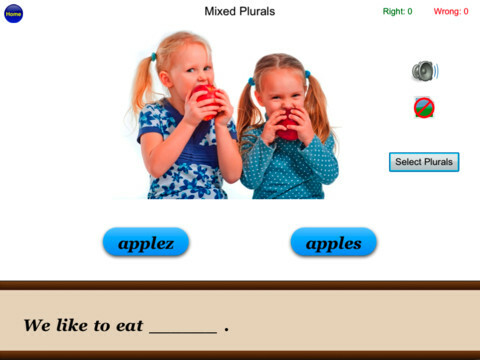 If you choose the Advanced option, the singular/base word will be shown and the user has to choose the plural/past tense form of the plural/verb, and state whether it is regular or irregular (for the irregular verbs, you must also choose the past participle). I love that the Irregular Plurals and Irregular Verbs applications have both cloze sentences as well as identifying past tense/regular/irregular words. It is great that there are two different levels for the Sentence Builder App so that one can determine which is appropriate for each user. I love that you can save student profiles on the Sentence Builder App. 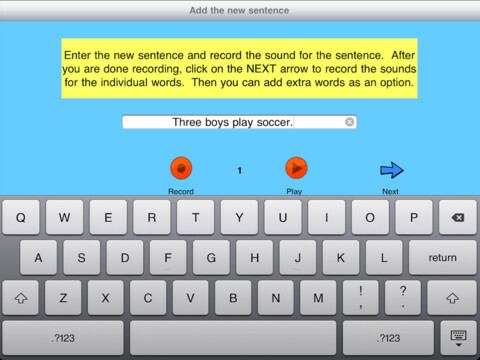 The Sentence Builder App is great to teach children about sentence order and punctuation. Being able to select the verbs/plurals to work on is wonderful. 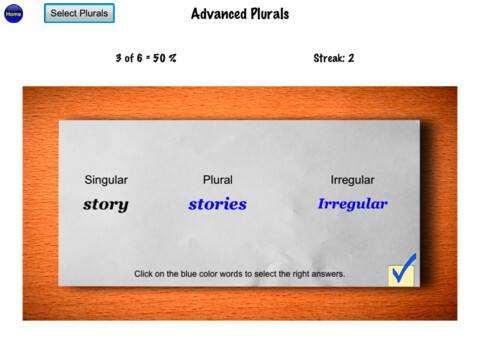 Irregular Verbs and Irregular Plurals both keep track of correct and incorrect answers at the top of the application. I love being able to create my own lessons for students on the Sentence Builder App. The application switches between different types of photos (3D illustrations, 2D illustrations, and real-life photos). It would be ideal for these to be uniform, but it is not a huge deal due to the fact that they are clear images and are related to the sentences. It is a bit confusing because most of the sentences start with a 3-4 word sentence and then add a word (such as an adjective, adverb, etc. ), but on a few of the categories the word added to the second sentence is not the one stated in the category. In addition, some of the categories state that they use different verbs, but the verb (such as "like") remains the same throughout the category. I would like to see progress reports for each app and instead of just stating if a sentence was completed or not, it would be great to have data per session stating if the child got the word(s) in the sentence correct or incorrect. Articulation/Fluency/Voice - Have children read the sentence aloud using appropriate speech sounds, fluency strategies, or vocal strategies. 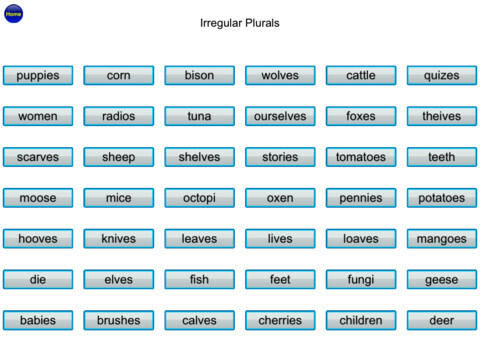 Grammar - Use the Irregular Plurals and Irregular Verbs to work on plurals and verbs with students. Have children create their own sentence using the verb or plural. Syntax - Use the Sentence Builder App to work on sentence structure and formation. Punctuation - Use the Sentence Builder App Level 2 to have children determine the type of punctuation to use on the end of each sentence. Sentence Expansion - The Sentence Builder App has pairs of sentences with the second sentence adding another word to the first. 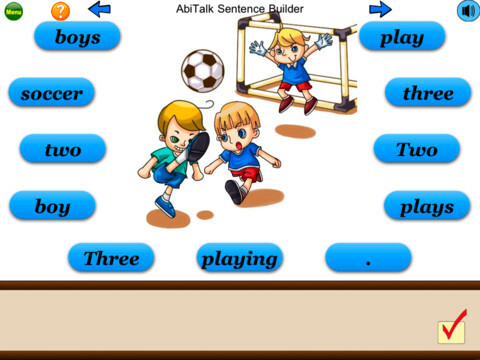 Use this application to focus on sentence expansion and you can choose the type of word (adjective, adverb, etc.) to focus on. Sentence Builder App, Irregular Plurals, and Irregular Verbs are available for the iPod Touch, iPhone, iPad, and Android for $2.99. They all have Free versions as well in which you can try out their applications. Consonantly Speaking was given codes for each of the applications to give away. No other form of compensation was given. Come back soon for a giveaway of these great applications!